Located on beautiful West Point Lake, our cabin is nestled in the quiet woods only a few steps from the shore. 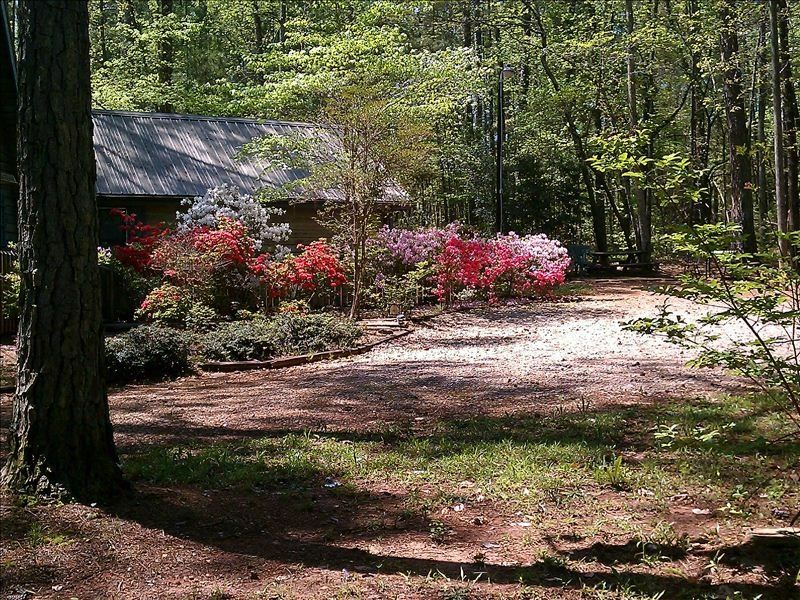 Enjoy Callaway Gardens(thirty min away),historic Pine Mountain, fish from the private dock, launch your boat and enjoy the 26,000 acre lake with 500 miles of forested shoreline, or just kick back and enjoy nature at her finest in the tranquillity of the cabin, deck, and yard. * Check-out 11:00 and Check-in 3:00. Late check-out available for additional fee. I’m a city girl now but I’ll forever be a country girl at heart. This home is off the beaten path with private dock access on the lake. It gets super dark at night ... so, bring your flashlights 🔦�!!!! We caught some nice sized catfish with pink worms and got several bites!!! Internet is a little slow and the cell phone reception is tricky but hey... you’re in the woods! Close proximity to all types of water activities for the kids. We had a very relaxing and comfortable 3 night stay at this Lake West Point Waterfront Cabin. The cabin was clean and stocked with necessities. Based on the location in the woods, we were pleasantly surprised with the lack of bugs and critters in the cabin. Great little cabin for boaters. We enjoyed our stay, and looking forward to coming back. Fun place to stay on the lake! The home had everything needed for a comfortable stay, especially the bed which I am picky about. There's plenty of room, plenty of tv's, and everything needed in the kitchen. I would definitely want to stay there again. The lake is beautiful and not crowded. Very homey, clean enjoyable for our family weekend! A group of our family got together for a weekend. There was 7 of us and all had a comfortable place to sleep. Plenty of room for preparing meals and dining together. Beautiful lake area and dock for boats.great weekend for all of us! Glad to recommend! Better yet can’t wait to go back! The house was great, kitchen was supplied with everything. Very large master bedroom that is located on the main floor.The dock is large enough for boat, jet ski,kayak. Everyone had a great time and enjoyed staying in the house.Will plan on booking another vacation at the property in the future.